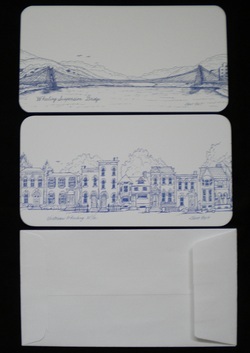 Included in pack are three Suspension Bridge cards and three Victorian Wheeling Homes cards with matching envelopes tied with white organza ribbon; blank on the reverse; measure 3-1/2" x 6-1/2"; $5 for pack of 6. 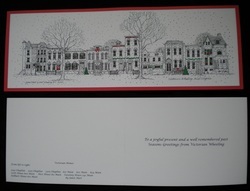 Victorian Wheeling Holiday Cards depicting a composite of actual Wheeling Victorian homes adorned for the holidays with snow falling; homes are identified on the inside; cards fold down the middle to fit in envelopes; INSIDE VERSE: "To a joyful present and a well remembered past - Seasons Greetings from Victorian Wheeling"; included are 10 in each pack with envelopes; measure 4-1/2" x 6-1/4" folded for mailing; $13 per pack. 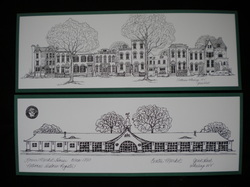 Wheeling notecards trimmed in green; cards fold down the middle to fit in envelopes; included in the pack are five cards of actual Victorian Wheeling homes and five cards of historic Lower Market House; blank on the inside except that the Victorian homes are identified; measure 4-1/2" x 6-1/4" folded for mailing; $12 per pack. 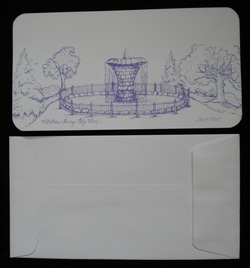 Martins Ferry correspondence cards depicting the fountain in City Park with envelopes; purple ink design on front and blank on the reverse; six per pack, tied with white organza ribbon; measure 3-1/2" x 6-1/2"; $5.00 per pack.